Valentine's Day isn't a huge event at our house, but since I have a daughter who loves every holiday I tried to make it a bigger deal by decorating early and crafting. Unfortunately, Shelby was not with us this weekend. She was in San Antonio with her youth group, but I sent her heart full of candy with her. I hate to say that I really don't have a ton of pictures from this week, but here is what I do have. We decided what a great day to take the littles to the zoo. After breakfast at a local breakfast house (which was yummy) we headed out. It was such a beautiful day in Houston. So much so that it seemed like everyone in Houston decided to go to the zoo as well. We had lunch at the zoo, saw all of the animals (including the flamingos). Then we headed home. We had one small snafu. My super husband fixed it really quickly and then we headed home. Matt's parents watched the girls while we had a night out. Our special night out included browsing some car lots. I was really hoping we find an amazing deal on a new minivan, but that didn't happen. Shirley (that's what Shelby and I named our van last year) is going to have to hang in there for while longer. We wrapped up our great day by purchasing a new tire and having dinner. On Sunday, our church had a big party to mark the end of The Story (the book). That's where this happened. 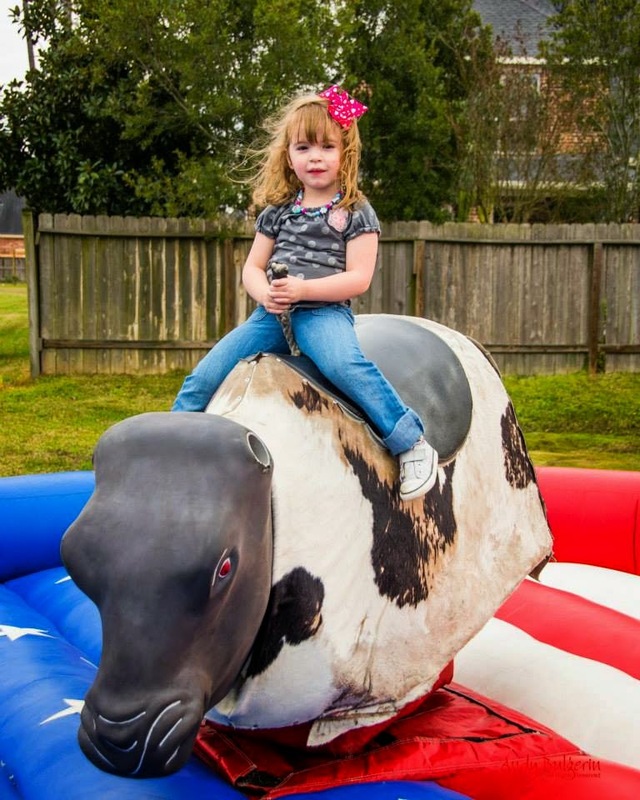 Thank you to my friend Andy for capturing this pictures as I video taped her first bull ride. She had a bunch of cheering for her. The girls had a blast in the bounce houses I barely got Morgan out of them. It was such a great afternoon with my church family.